DWG Columns for Explorer version 4.1 by JTB World is now available. DWG Editing Time column is new and shows how many hours and minutes the drawing has been edited. A lot of other DWG properties can be seen like DWG version and custom properties. See these in Explorer or file selection dialog boxes in your CAD product. 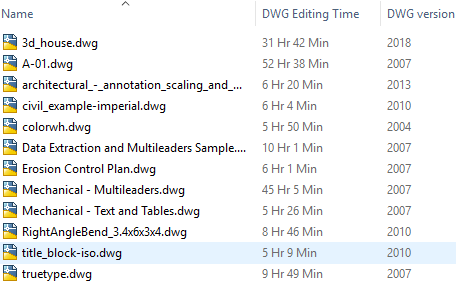 DWG Editing Time is the same thing as Total editing time that the commands TIME or DWGPROPS>Statistics are showing. The app works with drawing files created or edited with products like AutoCAD, Revit, Dassault Systemes DraftSight, Caddie, CADopia, progeCAD, Bricsys BricsCAD, IMSI TurboCAD, GRAPHISOFT ArchiCAD, GstarCAD, nanoCAD, MicroStation, ZWCAD+ and others. A 30 day trial of DWG Columns for Explorer is available as well as a freeware version that only shows the DWG version column.